The 1980s were a high point of factory involvement in Grand Prix motorcycle racing. Suzuki, Honda and Yamaha battled for technological dominance in the high-powered world of 500cc two-stroke racers - and to ride these beasts they employed the very best riders in the world. The likes of Rainey, Schwantz, Lawson and Mamola struggled to tame the raw power and brutal handling of bikes built without constraints and without any of the modern rider aids which make today's MotoGP four-stroke machines seem bland in comparison. The riders might have been paid handsomely for their efforts but as this film shows they paid a heavy price for their fame and stardom. 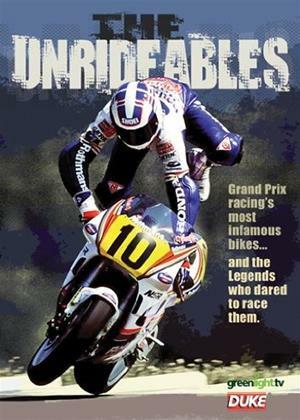 With loads of great action shots from the archives and revealing, frank interviews with many of the top riders this incredible documentary looks at the men who had to ride the unrideables.